Every year we return to Berry Head in the hope of seeing Bee Orchids. And somehow we always manage to just miss the right flowering window and come away disappointed. Are we even looking in the right places? Everyone else always seems to find them with ease. In my more paranoid moments I am beginning to wonder if there is some intricate conspiracy behind it all. Have I been imagining all those illustrations and photos and descriptions? Do Bee Orchids even exist? And disappointment can hardly register when there is so much else to see. Several flowers seem to be out so gloriously yet briefly before fading. More names are being added to our species database and there are a few more queries to puzzle over. We were hardly out of the blocks before this grass captured our attention. Even the verges of tarmac footpaths can yield things you haven't seen before. 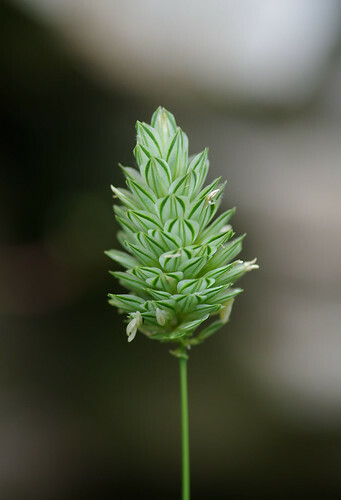 There was just the one Canary Grass specimen. After admiring the intriguing pattern, we continued down the path leading directly to the coast, passing the odd figwort or two along the way. At the path junction, we turned left towards Berry Head. To the side of the path everything was wild and overgrown. False oat grass rustled and bent in the breeze. Further along, a young cricket (probably the speckled bush variety) sat peering at us: perched just below the joint of a grass stem. It clung on with hooked claws, weighing up if we were friend or foe. 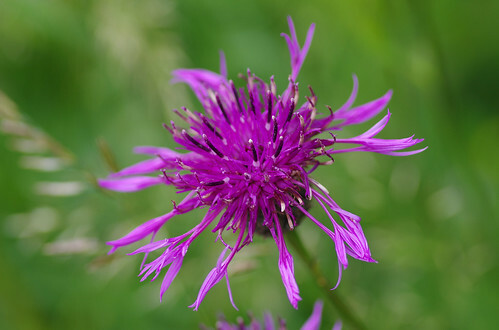 There were a lot of these knapweed flowers nestled together among the grasses. They are a welcoming sight (and smell) to many pollinating bees, flies and even beetles. In fact the predominating colours of this walk were pinks and purples. We passed pink common vetches. 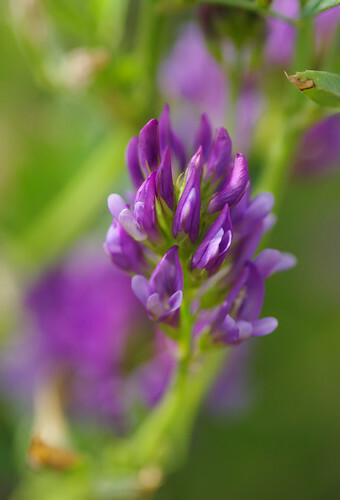 They had the characteristic vetch leaves with a notch in the middle and short spike but the stalks looked almost too thick to be vetches. Have the vetches hybridised with the peas? At times, short stretches resembled an allotment patch and I almost expected to see canes strung together and suspended Peter Andre CDs to deter the birds. These restharrows amused me. Sometimes it is hard to escape the impression that flowers resemble little faces. I thought these ones had rosy complexions gained from daytime drinking and hooked noses. 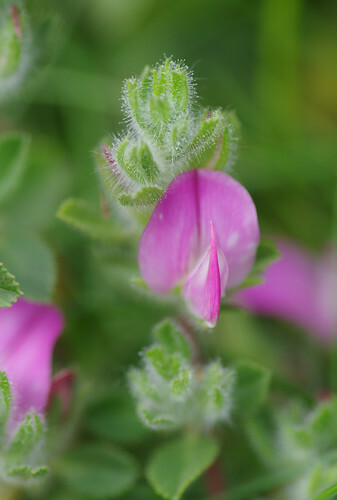 The rarer 'spiny' species of restharrow is supposed to be in the vicinity of the Berry Head but I did not see any examples of it. The one above matched the common variety, with red stalks and sticky hairs on the crown. It's odd how some things flower from the top down, while others bloom from the bottom up. I was surprised to find that agrimonies are members of the rose family, as visually they seem to have little in common. We explored an offshoot path and went back on the pink and purple theme. 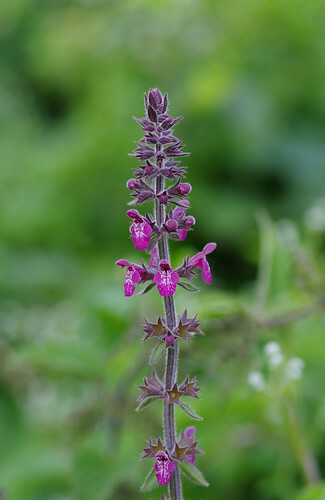 The flowers above are similar to those of woundworts but the square stalk, generally smaller stature and structure help distinguish betony beyond reasonable doubt. Lucernes make me think of clovers grafted on to the bodies of pea plants. The light was soft and at an aperture of f4, the lens gave a nice creamy blur. 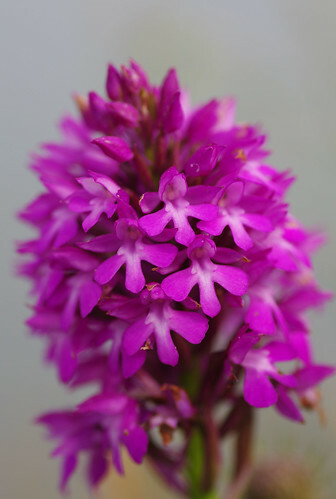 We may not have seen the distinctive brown bumblebee patterns but we did see one species of orchid. The pyramidal variety tend to have a denser, closely packed cluster of flowers at the top. Sherry captured them from a range of angles. This was possbily the best of the bunch. These ladybrids were caught mating on a tree mallow flower. 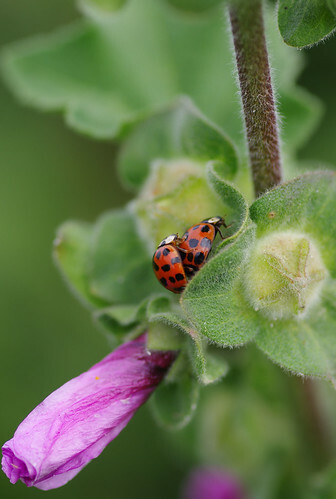 Since 2004 when they were first recorded in the UK, harlequin ladybrids have spread rapidly. It is widely thought that they pose the most serious threat to indigenous species of ladybird and other insects, being larger and able to survive longer. Harlequin larvae, for example, can eat the larvae of other native species. The problem is that harlequins have over a hundred different colour patterns. Many well-meaning individuals have inadvertently destroyed the wrong species thinking they have come across true harlequins. I would have liked to have included a full shot of the tree mallows. But against the harsh whiteness of the sky, the end results were unsatisfactory and the species has been filed under the 'try again next year' list. The background light here is too over-exposed but I have included this shot of a different ladybird. It could very well be one of the many harlequin markings on the body. 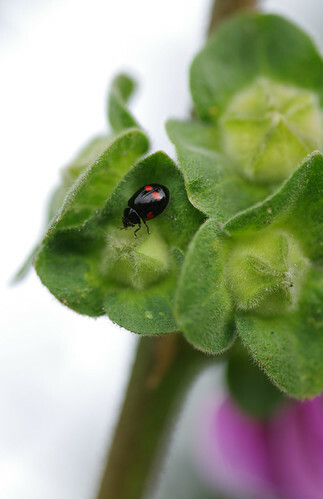 But it also bears more than a passing resemblance to a young two-spot ladybird. Confusingly, the young two-spots can have four-spots before maturing to their full size and regular pattern. 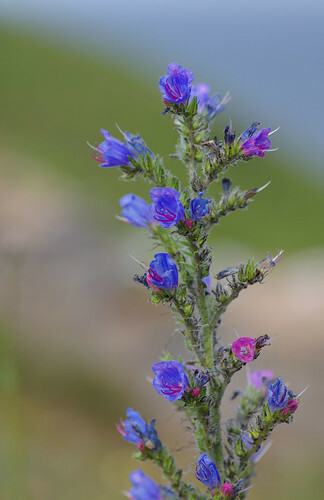 This flower is fairly common around the coasts of South Devon on headlands. The striking spike always creates an impression. Sometimes groups of these flowers can grow together in clusters. Later on we even found them in abundance on the grassy verge of the car park. Getting down low to photograph something can be trickier than it seems. Perspective has to be more precise, particularly when there is a lot of foreground and background detail. 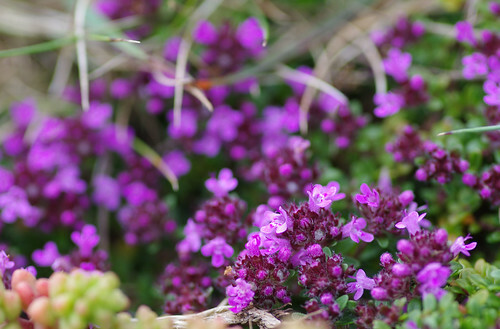 These wild thyme flowers were growing in close-cropped mats on the headland. I never associated the herb with the coast before. 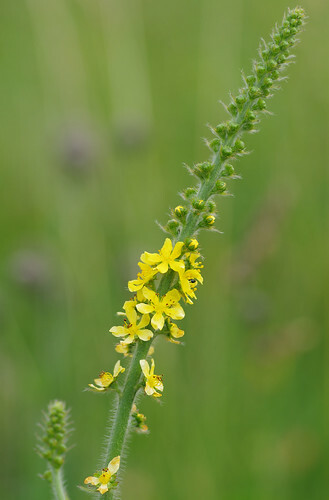 Next year, I will be keeping a sharp eye out to see if I can see any of the rare, parasitic Thyme Broomrapes. that feed on them. 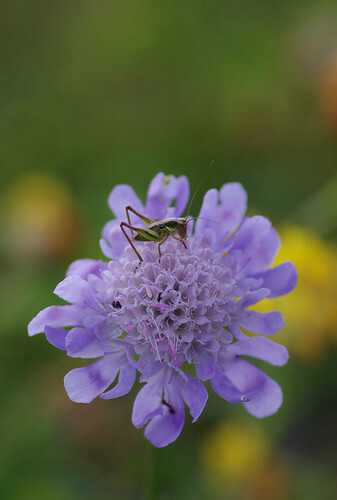 Berry Head is one of the few places where you can see these gorgeous delicate flowers. They prefer thin soils and can be seen in the summer for weeks on end. It makes me think how lucky we are to have these reserves on our doorstep. If development projects on the coast had been given carte blanche, species such as these might have died out altogether. Beyond clusters of eyebrights, where flies perched and showed us their compound eyes, there was this baby cricket. As it was early evening, the light was growing softer and suffusing everything with a golden glow. With their red-tinged leaves and their almost broccoli-like crowns, these hemp agrimonies were in abundance. 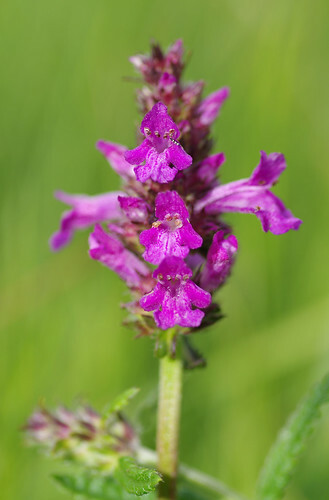 They are often seen in hedgerows and even on waste ground. For some reason, this species has proved difficult to capture on a number of occasions. 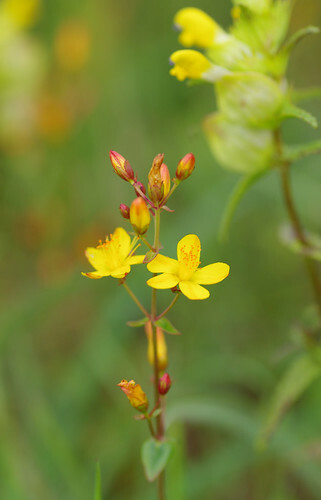 The buds are red-tipped and the stem is substantially more slender than other St John's-wort species. 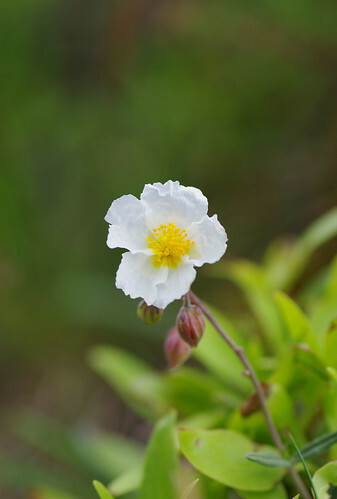 As we left the reserve behind, we noticed a tall plant with many stems and drooping white flowers. I have absolutely no idea as to what it could be but intend to return to Berry Head soon to renew my investigation. We had just left the Berry head Reserve behind and were walking back along Gillard Road when I noticed these two siblings at base level at the side of the road. 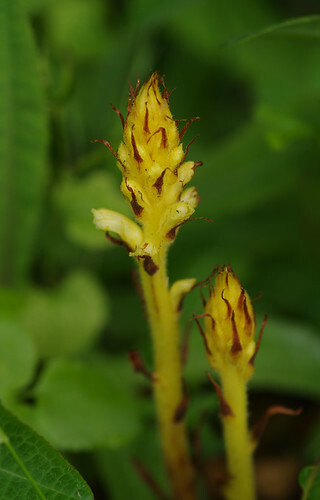 I got very excited; thinking we had found one of the rare broomrape species by accident. Further research revealed that this was a common species, albeit the uncommon yellow variation of the pink and brown flower we have seen on numerous occasions before. Last but not least, Sherry spotted this interesting specimen. Woundworts are in the same plant family as nettles. 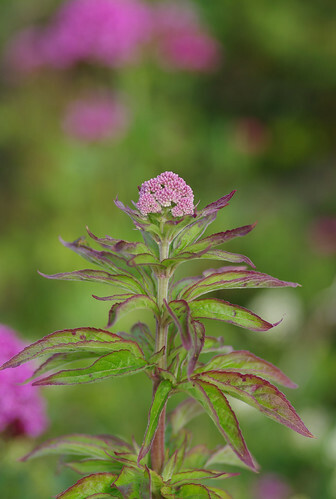 They have square stems which occasionally (as in the picture above) contort. This flower almost seems like a snake, charming its way upward to the heavens. We kept our feet firmly on the ground as we strolled along the long straight road; mindful of the fact that it was gone seven and we had not yet had our dinner. It's so easy to lose track of time when you immerse yourself in nature and leave your worries behind.